Somerville, a town in a diminishing rural hinterland, is toward the north of the Mornington Peninsula, 13 km east of Mornington. It is 50 km south-east of Melbourne, on the railway line from Frankston to Crib Point. The origin of the name is obscure, except that it was probably a preference expressed by local farm selectors in the early 1860s. It may have been named Somerville as a compliment to a British official or notable person, as Mornington and Cranbourne were named after British public figures. Somerville’s soil and climate were suitable for agriculture, and the area became the main one for orcharding in a district running form Tyabb to Hastings and west of Moorooduc. Important orchardists included Brunnings, Shepherds and Unthanks, and Brunnings also had a large fruit tree nursery along with Griffiths brothers’ Two Bays Nursery. During the 1880s the naval defence of Port Phillip Bay was fortified and attention turned to Western Port Bay as an alternative point of invasion. A railway line was run from Frankston to Crib Point passing by an Army encampment at Langwarrin. The station that was opened at Somerville was perfectly positioned for the transport of fruit crops. The Somerville Fruit Growers’ Association (1892) held its first annual show in 1895 and built an exhibition hall (1912-43). A cool store was opened in 1919, although the district’s main storage was at neighbouring Tyabb. 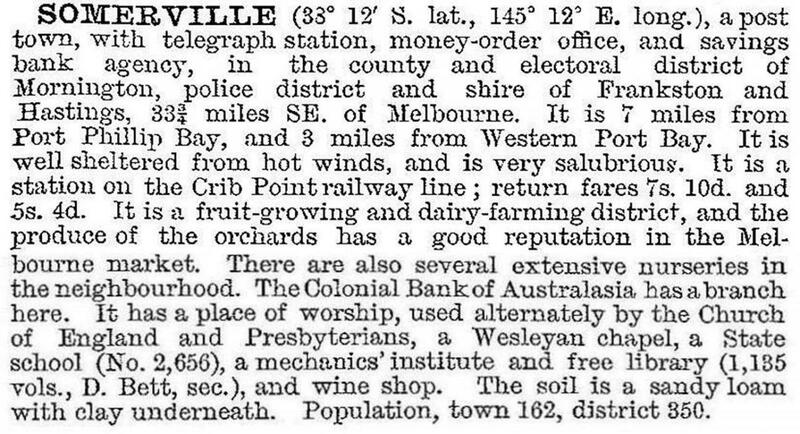 Somerville’s importance as a fruit growing area continued until the 1960s, when rising land values caused orchardists to look for new sites in Gippsland. Housing subdivisions began to impinge on the township and by the early 1980s the population exceeded 2000 people. Most of Somerville’s public amenities are clustered around the railway station, including the Fruit Growers’ Reserve, a community recreation centre, Somerville primary school, Anglican church, and the mechanics’ institute. There are three shopping areas: the traditional shopping strips; the drive in Somerville Plaza (c1999); and the drive in Centro Somerville (2009). A recreation centre, library and medical centre are also within walking distance. Further south there are the recent housing estates, with a recreation reserve, a bowling club, a community centre, a retirement village, a second State primary school, a State secondary college and a Catholic primary school (1994).